There are no permanent streams in this park, therefore, fresh water is very difficult to come across. Bring all water that you require. Any surface water must be well boiled, filtered or treated prior to consumption. 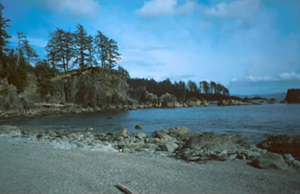 Lanz and Cox Islands were set aside as a provincial park to protect an unspoiled coastal wilderness environment. Together with the outer three islands of the Scott Islands chain (Beresford, Sartine and Triangle Islands) they protect some of the most important seabird nesting colonies in the world. Due to the extreme weather conditions and sea states that these islands can experience at any time of the year, this park receives very few visitors. The rugged, rocky coastline of these islands provides poor access for boaters and the steep slopes of the islands makes travel onshore near impossible. The only access to Lanz and Cox Islands Provincial Park is by boat. Only extremely experienced boaters should consider visiting these islands, as they experience open Pacific Ocean weather conditions. Boaters can reference marine chart #3625 (Scott Islands) for more information on this area. History: Lanz and Cox Islands were established as a Protected Area on July 12, 1995 as a result of the Vancouver Island Land Use Plan. Cultural Heritage: The Scott Island chain lies in the traditional territory of the Yutlinuk First Nation. These people died out in the early 1800s for a number of reasons, including the introduction of European diseases. Few signs of their existence remain today. Conservation: Lanz and Cox Islands have extremely high conservation values as they provide critical habitat for a number of seabirds, such as Rhinoceros Auklets, Cassin’s Auklets and Tufted Puffins, as well as several species of cormorant and petrel. These islands also contain numerous Bald eagle nests. In recent years there has been a reestablishment of a sea otter population in the kelp beds surrounding this area. Approved Purpose Statement and Zoning Plan [PDF] for Lanz and Cox Island Provincial Park is available online in pdf format. Anyone wishing to kayak in this area must be experienced due to the extreme weather and sea conditions. Though this area has been traditionally utilized by commercial fishers, the extreme weather and sea conditions make it unsuitable for recreational fishers. All anglers should check the current regulations issued by Fisheries and Oceans Canada prior to fishing. Anyone fishing or angling in British Columbia must have an appropriate licence. The difficult access to these parks limits wildlife viewing opportunities however boaters could expect to see a number of marine mammals and a variety of seabirds. Lanz and Cox Islands provide critical habitat for a number of seabirds, such as Rhinoceros Auklets, Cassin’s Auklets and Tufted Puffins, as well as several species of cormorant and petrel. These islands also contain numerous Bald eagle nests. In recent years there has been a reestablishment of a sea otter population in the kelp beds surrounding this area. While small fires are allowed, we encourage visitors to conserve the environment by minimizing the use of fire and using stoves instead. Never leave your fire unattended and practice “Leave No Trace” camping ethics.